Excerpt from XMPP Academy #1 starting at 1m33s. What are ejabberd backends? What backends are available in ejabberd and how do they work? Excerpt from XMPP Academy #2 starting at 2m05s. Excerpt from XMPP Academy #2 starting at 14m00s. What are ejabberd session backends and how to use them to scale? Excerpt from XMPP Academy #2 starting at 19m42s. Excerpt from XMPP Academy #1 starting at 16m44s. How does Apple and Google Push support work on ejabberd SaaS and ejabberd Business Edition? Excerpt from XMPP Academy #3 starting at 1m20s. What is the relationship between ejabberd Push support and XEP-0357: Push Notifications? Excerpt from XMPP Academy #3 starting at 22m34s. What are message carbons and how do they work? Excerpt from XMPP Academy #2 starting at 27m30s. Excerpt from XMPP Academy #2 starting at 29m51s. Excerpt from XMPP Academy #1 starting at 27m43s. What is the impact of Websocket on Web chat performance? Excerpt from XMPP Academy #3 starting at 25m02s. Why do avatars / carbons not work in MUC rooms? What is special about MUC rooms? Excerpt from XMPP Academy #2 starting at 34m15s. What are the typical tools for quick XMPP prototyping? 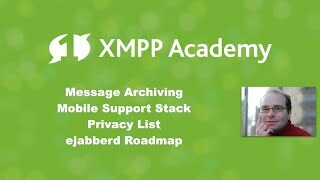 Excerpt from XMPP Academy #3 starting at 27m45s. How does ejabberd internally store messages which are not yet delivered? Excerpt from XMPP Academy #1 starting at 22m42s. How are privacy lists managed in ejabberd? 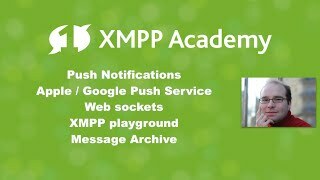 Excerpt from XMPP Academy #1 starting at 25m54s. Why do we seem to find duplicate in Message Archive Management backend? Excerpt from XMPP Academy #3 starting at 32m20s.